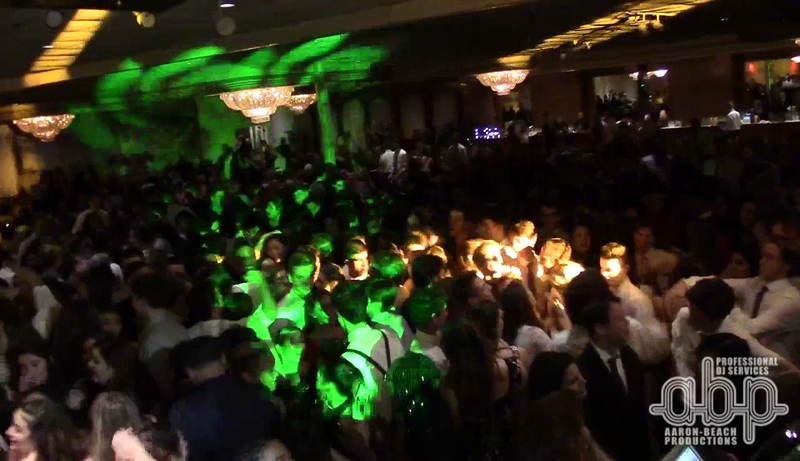 We returned for the 3rd annual 2016 Harvest Ball for La Salle Academy to a crowd approaching nearly 1200! The room was decorated with an amazing array of balloon stringers while a new creative element was implemented with the use of LED foam party sticks that were distributed after dinner. The added effect made the dance floor a "sea of light" while everyone danced from dinner to end of the event! Be sure to check out the image gallery below to see the LED foam sticks all the students were waving in the air! This year La Salle Academy wanted to enhance overall impact and decided to take the Harvest Ball to the next level, this year we did this by providing our largest multimedia package that provides 2 large rear projection screens and two mobile LCD TV screens creating a 'row of video'. At the start of the event we provided welcome motion text and graphics FX while the students registered and entered the room and during dinner. When the buffet style dinner was complete, the dance floor opened while multiple video FX ran continuously throughout the night. We also provided dual PTZ camera systems to project the crowd on the dance floor onto the screens, the crowd went wild! They really enjoyed seeing themselves partying and this provided great interaction between all students to have a great time. Another interactive element added this year was the "mini" Harvest Ball crowning for each grade level similar to a King & Queen ceremony used in a Prom event. This allowed for each grade to be represented for the school wide event. The students rocked the party right up to the end and from all accounts they all had a great time! We look forward to seeing you next year!